Designed for small, occasional jobs, SCOTSMAN Striper features four 8 in. wheels, loop handle with control lever, and pressure gauge. Adjustable spray head paints 2-6 in. lines, while instantaneous shut-off valve located at spray head eliminates dripping. Built from all welded steel with 4 gallon industrial-grade epoxy-coated tank, striper is available as basic unit or can be upgraded with modular power packs. Newstripe's SCOTSMAN paint striper allow you to realize immediate savings by using bulk paint in place of expensive aerosol cans. 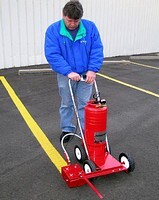 It is available as a basic unit or can be upgraded with modular power packs for striping ease. The SCOTSMAN is a great economy striper designed for smaller, occasional jobs. It is easy to use and control, featuring four 8" wheels, a loop handle with control lever and an easy to read pressure gauge. It's adjustable spray head paints 2"- 6" lines and the instantaneous shut off valve located at spray head means no dripping. Built from all welded steel and a 4 gallon industrial grade epoxy coated tank the SCOTSMAN is built to last. In fact, it is covered by Newstripe's 18 month warranty, the longest available.